Most people drive right by the small town of Fenton, Michigan where there are about 11,750 inhabitants. But those who live there know it boasts some good eats. One of which is Lucky’s Steakhouse. We have been going to Lucky’s now for over 15 years and even though we’ve moved to the next town south, it’s still a favorite spot. 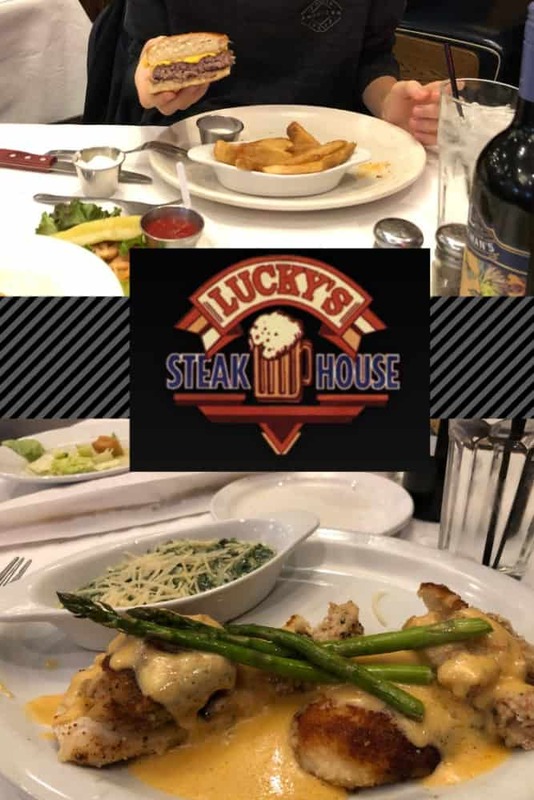 Lucky started his first steakhouse located in the mid-Michigan area in 1998. He wanted a restaurant with an atmosphere where friends and family look forward to gathering regularly. I once had a friend ask how they could repay me for a favor, to which I jokingly said, “A Lucky’s steak with mushroom and cheese.” When they arrived with the steak, I was surprised, but you better believe I ate it. Location: 17500 Silver Pkwy, Fenton, Michigan. Lucky’s also has locations in Bay City, Clio, Davison, Imlay City, and Midland). Menu: Lucky’s is known for its steak – after all, it’s a steakhouse. Whether you’re you want lunch or dinner the restaurant is a popular spot for either meal. The menu is American cuisine that not only consists of steak, but also seafood, pasta, BBQ and burgers. The atmosphere is casual and friendly with upscale service. You can pick any steak that you like – aged prime rib, top sirloin steak, NY strip steak, ribeye, porterhouse, filet mignon or filet mignon medallions. The steaks are seasoned with Lucky’s house blend of spices and arrive with a house special zip sauce. You also have the choice to top your steak with extras like sautéed mushrooms, grilled onions andmushrooms, crusted gorgonzola cheese, or grilled onions and roasted red peppers if you want. All entrées are served with homemade bread. I would say that the bread is second only to the steaks here. It comes out warm, fresh and soft with a side of butter and is one of my family’s favorite parts of eating here. You also get a house salad, or wedge salad or Caesar salad or cup of soup and choice of one side item (except entrées served with pasta). The croutons for the salad are created from the homemade bread. Thoughts: The atmosphere in Lucky’s is always happy and buzzing, the waitstaff are polite and I love the ambiance of the fireplace for those cold winter days we get in Michigan. Steak – I like to add Sautéed Mushrooms and Crusted Gorgonzola to mine. Double Cut Lamb Chops – Four prime chargrilled chops. crabmeat, grilled asparagus and lobster cream sauce. paired with the sauce that has a hint of wine. My husband loves to order the Fish and Chips which come out golden crispy on the outside and flaky on the inside. When my kids were little, they loved to get the kids’ pizza. Now that they’re older, they opt for the burger and fries, which I think are the best deal in town. Lucky’s is usually crowded so if you’re going on the weekend, go early. However, if you do have to wait, it’s worth it! Price Range: Appetizers $6.49 to $12.99. Salads $4.99 to $11.99. Steaks $15.99 to $23.99 with custom add ons from $1.99 to lobster tail at $9.99. Burgers $9.49 to $9.99. Kids menu $4.29 to $8.79. Guest Reviewer Bio: Vickie Gould is a Master Herbalist and wellness coach who loves food and travel. She is the best selling author of The Waiting Room and Herb Journal. By changing her lifestyle, eating habits and lowering her toxin load, she is back to living life after being in bed 16-18 hours per day due to chronic Lyme disease. She writes for fun, to inspire and to give hope to those with chronic conditions. Visit her blog at www.detoxifiedlife-style.com.